2217 W. Texas Street Carlsbad, New Mexico. On the corner of 6th Street & Texas Street. Auction starts at 9 AM. Sales are final and bids are for the entire unit. 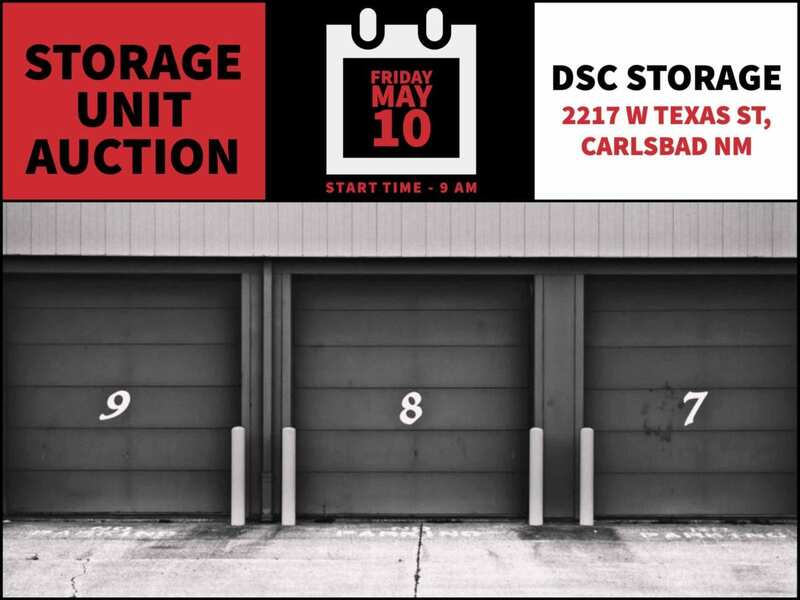 The storage unit will be opened for a 5 minute period to view items at door prior to beginning auction on each unit. You will not be allowed to enter the storage unit or touch any items prior to bidding. Contact DSC Storage immediately when the auction ends to arrange payment for and pick up of the unit contents. Successful bidders shall be responsible to haul ALL contents of any unit purchased. No Buyers Fees will be charged. What you bid for the item is what you pay for the item. All sales are final. A forklift will be provided by the auctioneers for smaller items. Thus bring your trucks and wreckers. Terms of Payment: CASH ONLY. Payments shall be made to DSC Storage. Respect the property, managers, tenants, and other buyers at all times.